Does anyone have a preference on what 2D symbol you would like to use to represent Simpson Strong-Walls. I can represent each type with a different symbol or use the same symbol for both. I can also include other pre-fab shearwall panels from other manufacturers if requested, I'm only familiar with Simpson's products. 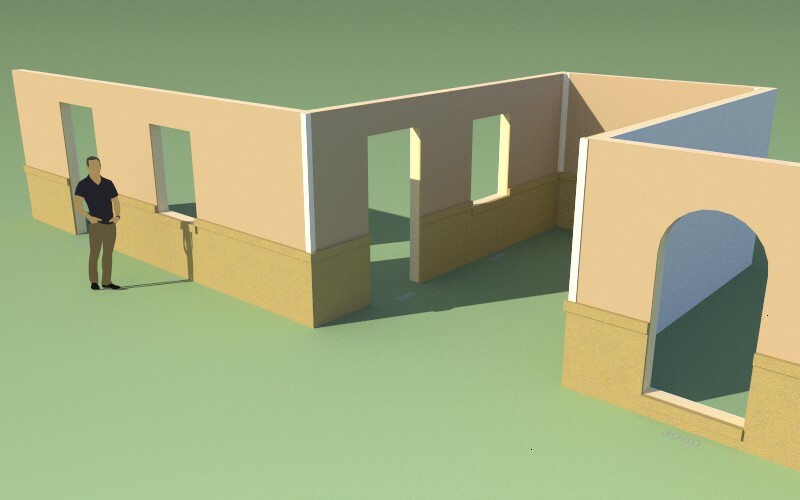 - Added the ability to draw, move and delete pre-fab shear wall panels with the SSW Toolset. - Added a parameter in the global settings (General tab) in order to toggle SSW annotations independent of window, door and column annotations. - SSW annotations and representative geometry added to the 2D and 3D (no framing) modes. The first thing you may notice with the SSW tool is that the current selection of sizes (widths and heights) of the pre-fab shearwalls is limited to 24" wide and between 8' and 12' in height. I also do not have any metric sizes or manufacturers other than these two (Hardy Frame HFX (Mitek) and Simpson Strong-Tie). I will roll out the full line of both manufacturers lines in the next few days however I have a few more smaller but hotter items that I would like to address first. 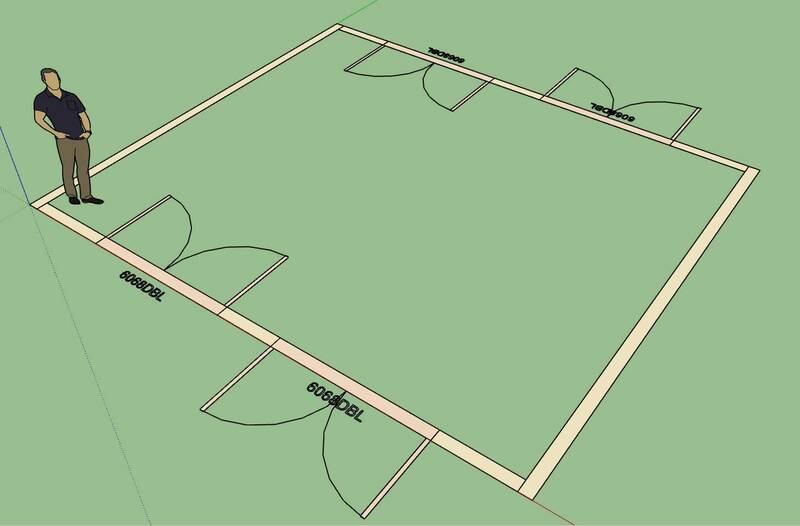 The first item is to allow the user the ability to toggle the placement of windows/doors/columns/SSWs from their center to left or right. I'm considering using the SHIFT key to make this toggle unless there are any specific objections. Once I have this feature up and running I would like to make a tutorial video for both columns and SSW's since both of these items are fairly mature as they currently stand and a video would go along way in explaining some of the the parameters for each of these items. 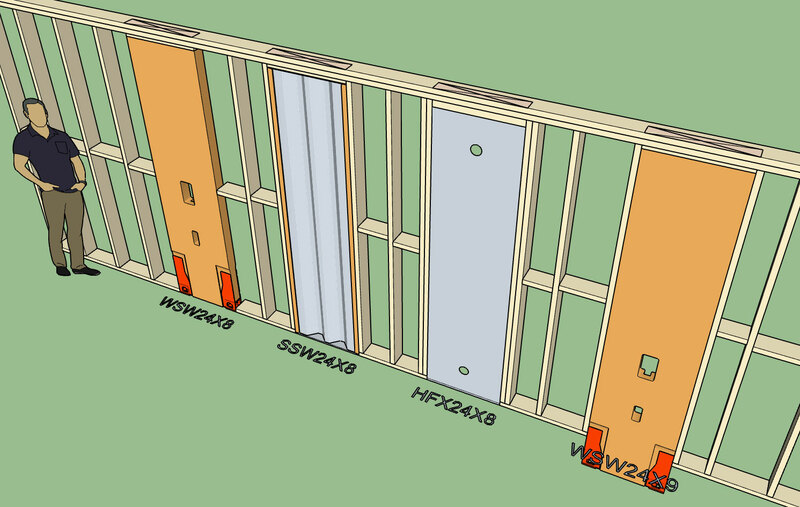 For the WSW (wood) series of Simpson Strong-Walls I have the trim feature now enabled and it seems fairly robust. 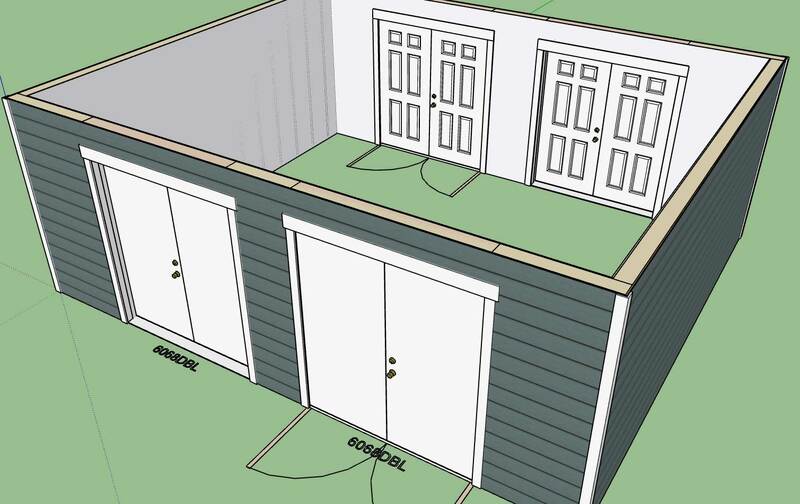 This particular trim module is now primed for shed and gable wall situations where a WSW panel might be trimmed at some arbitrary incline rather than 90 degrees. The next major item is the external wainscoting or dual cladding configuration for exterior walls. Now that I have a firm handle on a decent trim method I will employ this same technique in dealing with ext. wainscoting which will alleviate the need for a complex algorithm in dealing with openings bisected by a change in cladding or sheathing. I should be able to wrap this one up in the next 24 hours. - Added the ability to toggle between center, left or right positioning (by pressing the CTRL key) while drawing windows, doors, columns or SSWs. This was a highly requested update and did not require any significant code changes. I strongly suggest everyone upgrade to this latest release to take advantage of the convenience of being able to toggle the position of these elements, a small upgrade but a large functional increase. - Logic to trim back window and door exterior trim as well as corner trim. - Logic to check for wainscoting with annotation placement. 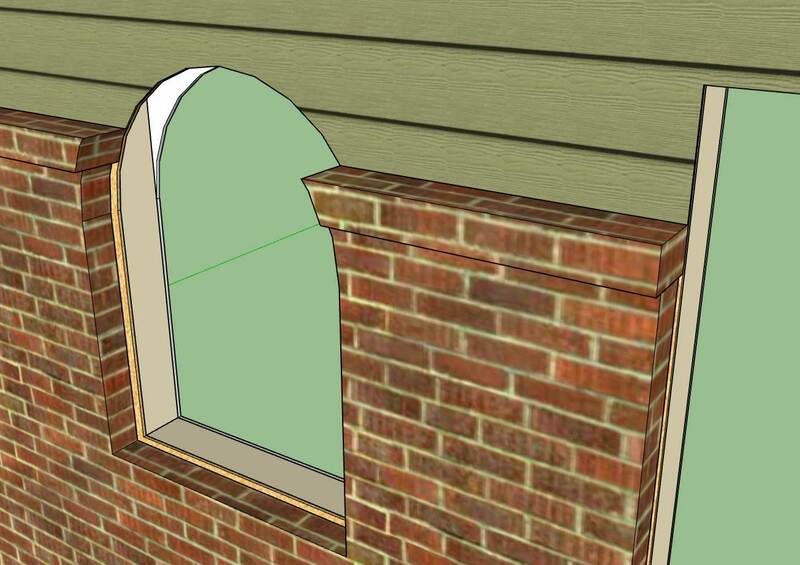 Not sure what to do with the bottom of the window location where it cuts out the wainscoting (brick, cultured stone etc...) this should also receive a ledge (ie. rowblock) as well. Notice that the ledge extends beyond the air gap to the sheathing or framing (if sheathing disabled). Also note that wainscoting and ledge are able to bisect curved windows or doors as shown. This additional feature is fairly complex so I am sure there may be some situations that I have not yet encountered and may be some cause for geometrical errors, only further testing will tell. 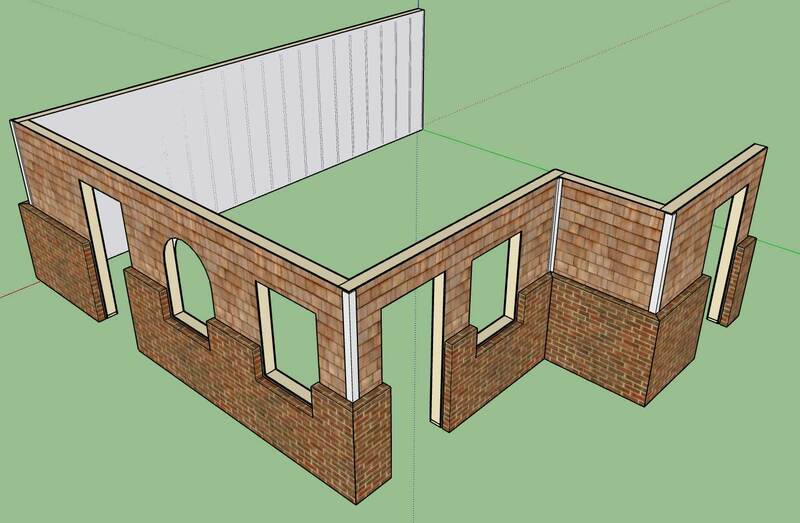 - Enabled exterior wainscoting for Ext-Int walls. - Added additional parameters to the wainscot menu for window and wall ledges. 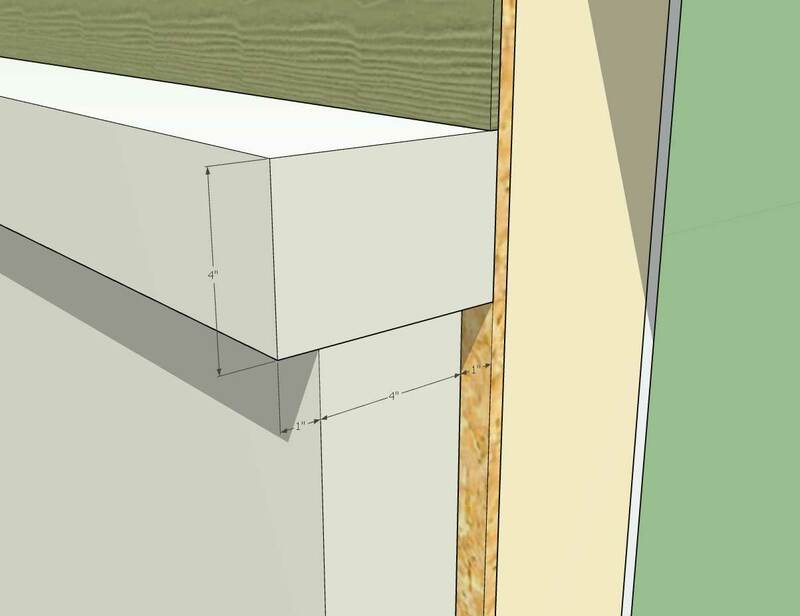 - Wainscot "cut" parameter added to the exterior trim menu in order to optionally cut corner trim at the wainscot height. There are still a few more parameters and features that I feel needed to be added to this new feature class. I am also willing to take suggestions on how to make this more useful. Please give it a go and let me know what you think. The wainscoting has also been added into the wall preset system. Which brings me to a new idea I just had as I was applying presets to a few walls this morning. The wall preset feature is quite handy but rather tedious to use if one wants to apply a specific preset to a number of walls (granted the wall grouping feature would come in handy here but that is still in development). What would be really handy is to have a "paintbrush" tool, where one could select any given wall panel and then all of its settings could then be transferred to any other wall panel with a single click of the mouse. Essentially treating the initially selected wall as a "preset" and then applying that preset to any walls selected. This would greatly speed up any changes one might need to make to a bunch of walls. 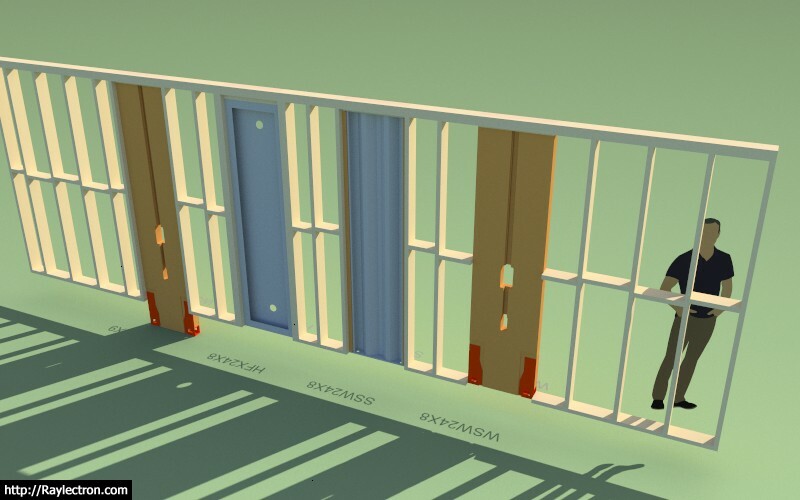 I also think it would useful to have the tool differentiate between exterior and interior wall types. In other words if you initially select an exterior wall (ext-int) to copy those settings could not be applied to an interior wall (int-int). I've got a few small fires to put out this morning, but other than that what should be next on the list? - Add parameter for (glass) grille spacing both horz. and vert. - Enable Material Library (skm files). I will add the full glass and half glass later today and then roll out a new sub-rev. - Added the following double door types: solid, six panel, half glass, full glass. Choosing LH or RH places the door hardware on the indicated side of the double door. I should probably add an additional option "LRH" that places the hardware on both doors. The image shows all as in-swing doors but they can also be drawn as out-swing as well. 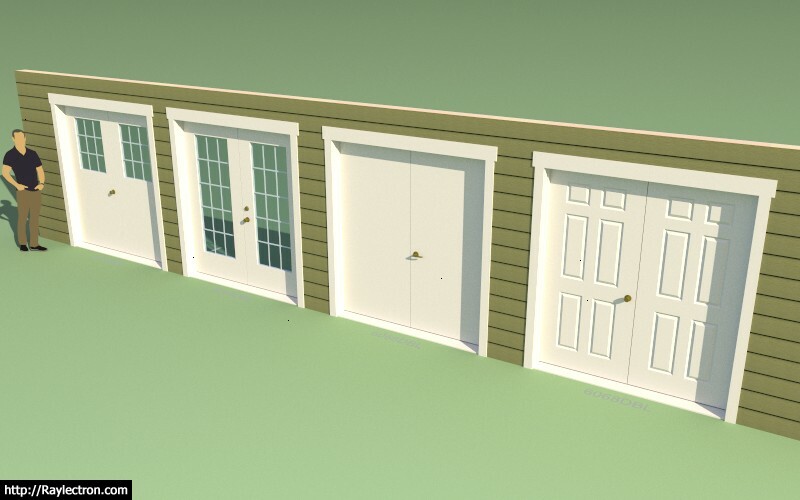 I have not shown an astragal for any of the double doors but if someone would like that option added please indicate and also send me details on how you would like it modeled. Similar to the truss plugin the beams created within the wall plugin will be able to be analyzed directly with the beam calculator on my website via the engineering tools (engineering icon). This chunk of code is already fairly well tested and is simply a matter of recycling some of it from the Truss Plugin. Later on I would also like to add steel beams (W, C, L, and HSS) but this will be based on user demand. I would also like to bring the engineering calcs directly within the plugin so that the user can run the numbers even if they are offline, something for the long term todo list. - Fixed a bug where wall corner trim thickness equals trim width. This will now allow the user to specify a 1.5" x 1.5" interior corner trim. 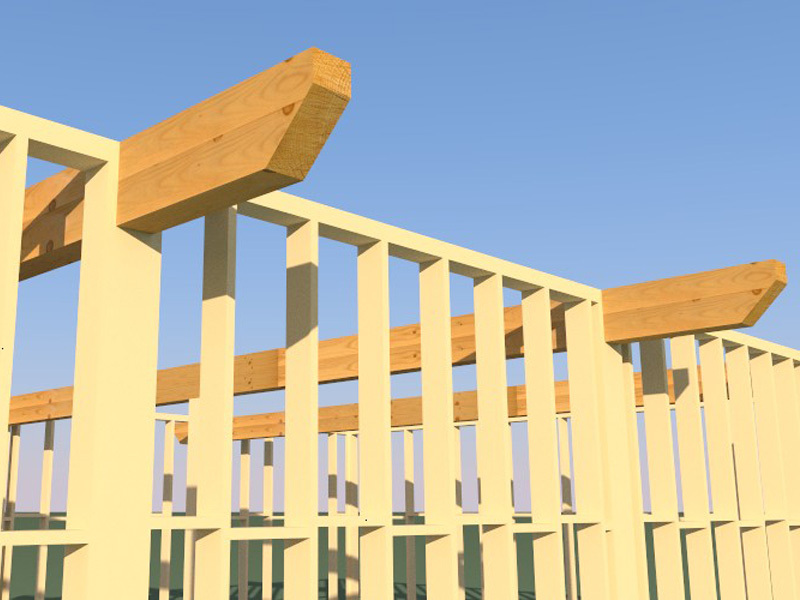 - Added the ability to draw and edit beams with the Beams/Column Toolset. 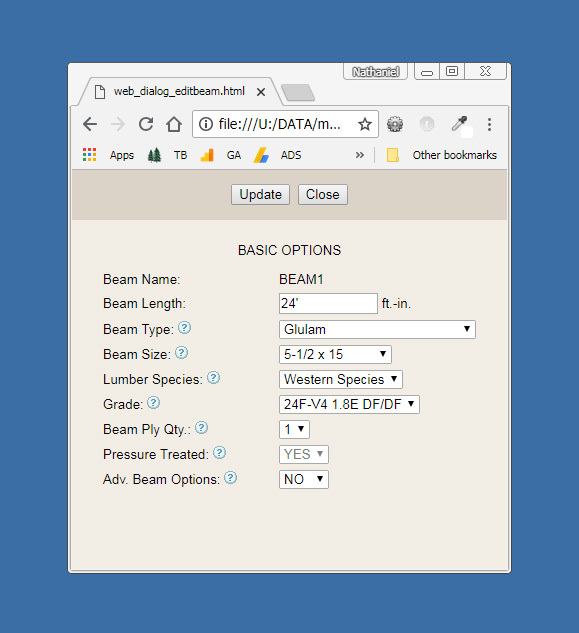 - Glulam, PSL, LVL, LSL, Timber and Lumber beam types added to the beam module. 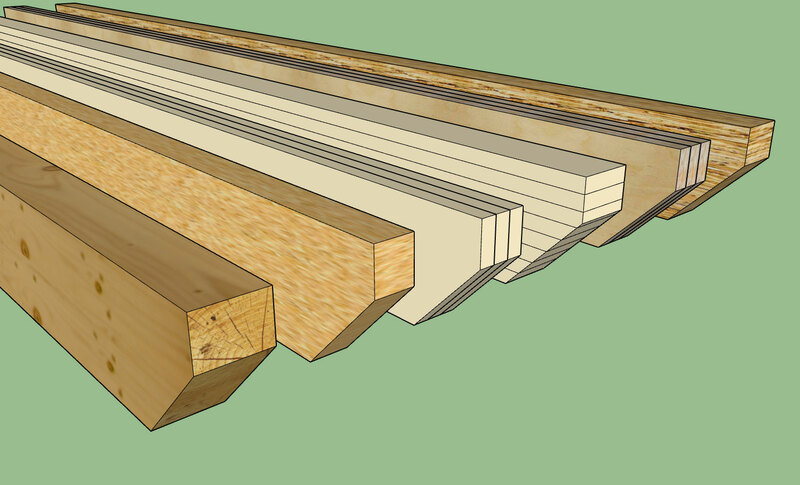 - Start and end cut options (miter,firecut) added to the advanced options for beams. Glulam species are currently Western Species and Southern Pine. SCL lumber (LVL, LSL, PSL) are the US industry standard sizes (Weyerhauser, Boise Cascade, Louisiana- Pacific). The miter cut puts the diagonal facing the bottom, the fire cut puts the diagonal facing the top.